For the month of December, we are offering $40.00 OFF dental prophylaxes. Does your pet have bad breath? Unfortunately, most pets do and this is not normal. The foul odor you smell is caused by an infection in their mouth. The most common cause of infection in your pet’s mouth is periodontal disease, which affects over 75% of pets over 2 years of age. Periodontal disease is a progressive and irreversible loss of the structures surrounding the teeth (see image A) caused by chronic infection and inflammation in the mouth. When your pet eats, residual food particles in the mouth promote the growth of bacteria. The bacteria form a slime layer, known as plaque, which attaches to the teeth and hardens to form tartar and calculus. (See image B). 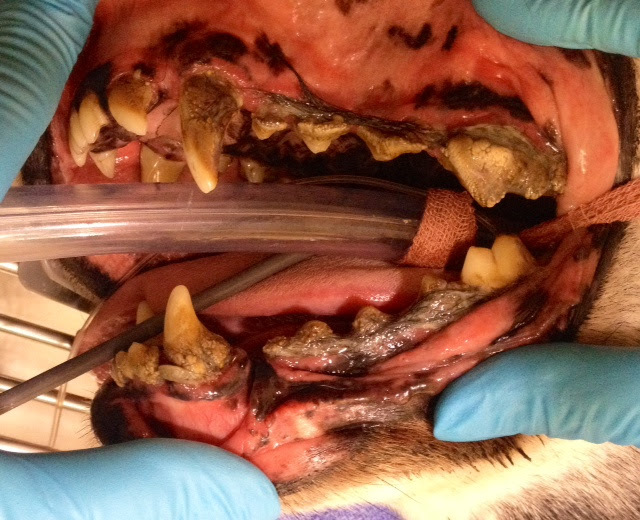 Image A – Periodontal disease can cause irreversible damage to your pet’s dentition. Image B – Tartar and calculus build-upon feline teeth. Grade 1: Gingivitis only. No loss of support tissues. Grade 2: <25% tissue attachment loss. Grade 3: 25-50% tissue attachment loss. Gum recession may lead to tooth root exposure. Affected teeth may begin to be mobile in the sockets. Grade 4: >50% tissue attachment loss. Mobile teeth due to significant loss of supporting tissues. The first step in treating periodontal disease requires cleaning the teeth and surrounding tissues. Because your pet will not lie down quietly for a dental cleaning, general anesthesia is required. To prepare anesthesia, our veterinarian will do a thorough examination of your pet, perform blood work and discuss the procedure with you. Your pet will be monitored closely throughout the entire procedure by qualified nurses: your pet’s safety is our primary concern. After the teeth are cleaned with ultrasonic scaling, our nurses will take digital x-rays of the mouth to check for pathology hiding below the gum line (see image 1-4). Our veterinarian then will contact you to further discuss with you any other procedures that may need to be performed. Our veterinarians are trained in advanced periodontal work and feel very comfortable with explaining further processes of intra-oral surgery. 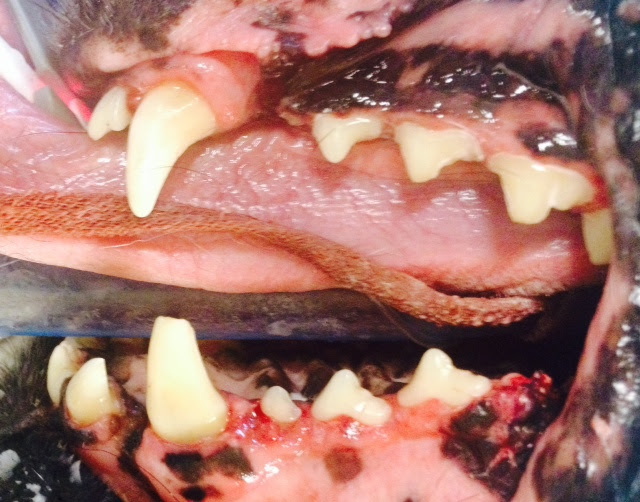 Image C – Your veterinarian can take radiographs, like this one, to look for specific dental issues. 2) Resorptive lesion on lower K9 - in a dog. 4) Resorptive lesion- Feline - Most common in cats. After the cleaning, radiographs, and (if needed) intra-oral surgery, we use a high-speed polisher to fill in any unwanted grooves and to add shine! Annual professional teeth cleaning. Some breeds (e.g. : small breeds) may require more frequent cleanings. 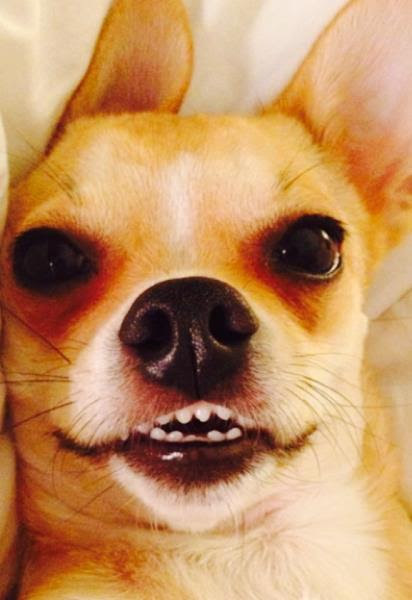 Just as people need their teeth cleaned regularly, your pet does too.